When I was a kid, I loved the holiday season. Presents were cool and all, but the icing on the cake was the children’s specials that came on TV during the season. These were specials that were on even before my time. I vaguely remember Jack Frost growing up as a kid, but like all things in the past, memories tend to fade away. But the feeling I had when watching the TV special is something I never forgot. The story is narrated by Pardon-Me-Pete (voiced by Buddy Hackett), the star groundhog that tells us of 6 weeks of more winter, or an early Spring. Groundhog Pete tells the story of Jack Frost (voiced by Robert Morse), and his affection for the lovely Elisa (voiced by Debra Clinger). On one winter day, Jack Frost visits the town of January Junction, which is a small town ruled by the tyrannical Cossack Kubla Kraus (voiced by Paul Frees). As Jack brings in winter, as he does every season, he falls in love with Elisa. He asks Father Winter (voiced by Paul Frees) to grant his wish of becoming human to win Elisa’s heart. Upon Jacks transformation, he realizes what it is to be human, fall in love, and to live as humans do. Elisa is kidnapped by the evil Kubla Kraus and taken to his castle on top of Miserable Mountain. Jack and his friends try to rescue Elisa from Kubla Kraus, but Jack is captured. He asks father time to turn him back into Jack Frost, so he can rescue Elisa, and save the town from Kraus’s robot army. In the end, Jack loses Elisa’s love to Sir Ravenau, a golden knight. Jack is forced to continue is life as Jack Frost, giving winter to the world, and joy to children. This is probably one of the greatest children’s specials in television history. When I was watching Jack Frost, my daughter (who is 2) saw it on TV, sat on my lap, and enjoyed all 49 minutes. She got scared when Kraus was mad, and cheered when Jack saved the day. I couldn’t ask for more than that. The story was simple, innocent, and fun. Don’t get me wrong, a lot of today’s cartoons are bonafide classics. We can’t forget the contribution of “The Lion King”, “Cars”, “Ice Age”, etc. These are true one-timer's that etched its way in film history. 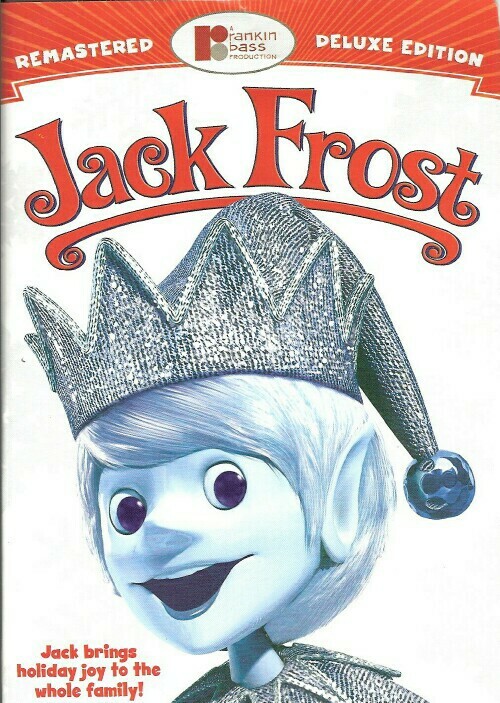 But they all got their influence, in one way or another, by Rankin Bass’s Jack Frost. This is one movie that’s pure innocence and enjoyment at its best. There are a couple of extras that round out the DVD package. The first is Totally Cool Crafty Creations, with Francine Flake. Flakey, as she calls herself, shows you crafty ways to make snowflakes, snow globes, and indoor snow. This segment is kind of cool, in a Martha Stewart sort of way, with Flakey having some comedic interaction with some of the character clips from the movie. If anything, you’ll enjoy it for the delicious sweet that is “Flakey”. She definitely melted my snow, if you get my drift! “snips” three songs from the movie (”Jack Frost”, “Just What I Always Wanted”, “The Groundhog Song”) and compiles them in one sing-a-long karaoke styled “thing”, with a bouncing flake that flows with the rhythm of each song. Why? I have no F’in clue. Will this help you get chicks at Karaoke night? Probably not! Finally, 4 trailers for cartoons to come, “Scooby-Doo and the Goblin King”, “Fred Claus”, “Looney Tunes Golden Collection Vol. 6”, and “Smurfs Season 1 Vol. 2”.Again, why? I have no F’in clue. Will this get you chicks at the Blockbuster? Probably not! Keep in mind, this is an old movie revamped in digital format. Nothing is perfect, and Jack Frost is a sure fire example of that. The monaural audio provided decent sound. >Though, not Dolby, it was adequate enough to provide clarity and crispness to the character voices, instrumentals and song routines. The DVD is a single-sided, single-layered format providing a standard aspect ratio of 1:33:1. I think the DVD was kept in this format to preserve the original television viewing experience, standard box, not widescreen. I have to give Warner a red mark on this one. In today’s time, widescreen is the optimal choice, and to update the aspect ratio to a 16:9 would have been a better direction. The coloration was vivid, and deep. The black of Kubla Kraus was dark, and sharp, and the reds blues were bright and forthcoming. There was a blue tint to the film, but I think this visual effect was purposely done to give the impression of cold and winter. Similar to that of other styles like “Gone in 60 Seconds”, with the color tone set in orange/yellow to give the ambience of heat and humidity, or the green tinge in the “Matrix” trilogies to give that feeling of a computer screen. There are a few questions I had to ask myself when I watching Jack Frost. Was this a great movie, or was it an ok movie? Though a bit on the slow side, the special effects were less-than-spectacular, and the extras sucked, it was simply, enjoyable classic with a very straightforward message, Merry Christmas. Krush is giving Jack Frost 3.5 out of 5. It’s been Krush tested, TOV approved!